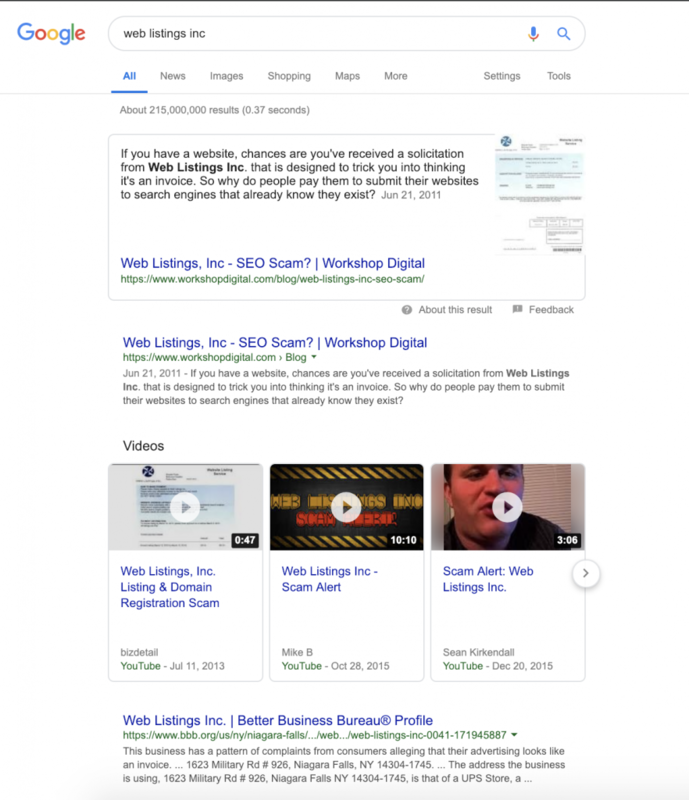 Web Listings, Inc – SEO Scam? Update: This blog was originally posted on June 21, 2011 and updated on January 30, 2019. At Workshop Digital, we’re always pushing ourselves to learn from previous research and predict future trends. Sometimes, this means revisiting old content and analyzing both its past and present impact. With this in mind, I took a look at a blog post I wrote nearly eight years ago, which drove traffic for years—until recently. If I sent you a letter saying you needed to pay $85 per year to get your house listed with the Post Office, would you pay it? No! You’d toss it in the trash and possibly file a complaint with the FTC. If you have a website, chances are you’ve received a solicitation from Web Listings Inc. that is designed to trick you into thinking it’s an invoice. So why do people pay them to submit their websites to search engines that already know they exist? Look closely. If you read the fine print, it says, “This is not a bill. This is a solicitation.” A simple Google search for “Web Listings Inc.” turns up dozens of scam and fraud alerts. It’s common knowledge that search engines have no problem discovering new websites and crawling most types of content. Finally, the top-three search engines account for 95% of the search volume in the United States. There’s no need to submit to 20! People don’t read the fine print. It’s common practice to hide the true terms of a deal in small print. People don’t research a company properly before doing business with them. It looks official, so it must be legitimate, right? People are motivated by fear of losing their visibility in search engines. Fear of loss is a more powerful motivator than potential gain. It deepens the distrust people have for SEO and our industry in general. It wastes small businesses’ hard-earned money. It adds absolutely no value to a website or business. It preys on people’s fears. I also hate this because it’s apparent that enough people are still falling for it to remain profitable, and probably wildly so. Please, research a company before you send them money. Read the fine print. Ask around. If you still need help, Google it. I’m sure you’ll find a helpful answer from somebody that didn’t pay $85 a year to have their site listed there. I first published this post in 2011 and it has been one of our most popular blog entry points every single month until recently. Apparently not enough people were reading the fine print and their business model was sustainable for YEARS. Fast forward to 2019 and we noticed that fewer people were searching for “Web Listings Inc” and reaching our site each month compared to previous years. Check out these organic traffic stats showing a consistent spike each month for the past two years. Then…nothing over the past 6 months. Just a trickle of visitors and a clear deviation from the previous drip, drip, drip of traffic. Why? And why do we care? I’m a data geek. And like all data geeks, I have to understand WHY something happened. First, I ruled out a change in our organic search rankings. We still own the top organic result and a rich snippet for organic search queries related to “Web Listings Inc”. Our rankings are still strong in Google Search Console as well. The horrible online reputation, outdated business model, and an inability to offer a valuable service all contributed to a change in their marketing tactics. Direct mail no longer seems to work, hence the drop in organic search volume during the first week of each month. What’s the impact? Well, none for our business. While we get the occasional blog comment or angry phone call from people who don’t read the fine print (or the actual contents of the blog post) and think that we are Web Listings Inc, we have never gotten a sales lead or new client from this blog post. I am ok with that. Hopefully we have saved a lot of people a lot of money and that’s a solid ROI on an ancient blog post. Ha! Mine asked for $85.00 LOL! Thanks for posting, I just got a letter myself. Ask me for $85, looked just like an invoice. Craziness. Thanks for posting!! The scam must be working so well that they decided to raise their rates. Shameful. Thanks for sharing. We almost sent it in, if it wasn’t for your information we probably would have sent it in. At the last moment I found your website, and it was just like you said, thanks for saving me $85. 6/27/2016 Can’t thank you enough. I just got one of these, knowing I opted for the domain privacy when I registered, Googled them. And apparently this scam has worked so well that they asked me for $85. Just got the same, it appears exactly as a bill due for $85.00. Only if you read further you see the disclaimer. A normally busy person can easily fail to see that this is not a bill. This appears to me as a classic fraud attempt. Is there a way to bring these guys to accountability? Yep, I just received a letter today requesting $85 for their service. No way, as already mentioned there are free services that do the same. It’s a darn shame crooks like them want to take advantage of people. Just got the “Bill” today for $85. What a scam. Why are people so gullible? Thanks for confirming my suspicions. Just got the mail, yup $85. I just got the fear of losing my website before calling 1and1. Thankfully they confirm it was scam, then I saw this blog. Thanks for the confirmation! and the beat goes on. It’s October 2012 and I just got my solicitation a couple weeks ago. First response was it freaked me out. Perhaps I forgot to renew my domain? Couldn’t be. Then I chilled out and really took a look at the solicitation. Then I came here to see if there were others. And sure enough! Yeah, this damnable thing comes off like a bill and where I come from, the first impulse is to pay (most) of your bills. I can see how people might just go on autopilot and pay these bastards. other hand, at least they help the post office! 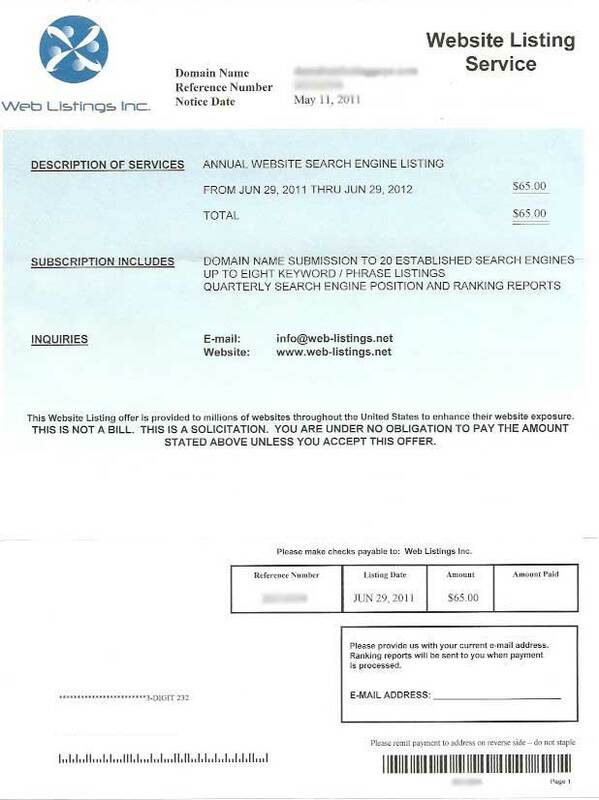 I received a letter on May 10, 2013 from Web Listings, Inc., requesting a payment of $ 85.00 to ensure listing of my website. Mine was also for $85. Too bad they don’t provide a self-stamped return envelope, I would have liked to return their “bill” in shreds! Thank you for posting this. As you said I just received the solicitation (August 2013) and I thought this was something my webmaster registered me and I was ready to pay it. I tried to call them to verify the service but there is no phone number on the “invoice” and then when I tried to find the company online I found your page. This is really a scam. Thanks again for posting! I sent a copy of this letter to my Attorney’s General and the AG of New York in the hopes that these people are shut down. I suggest everybody do the same. Are you actually defending and excusing this company because people can’t read English? You’re a perfect example of why the court system is so screwed up. Attack the offended, don’t prosecute the offender! Got one of these today – looked very official. But I was skeptical so I Googled it. Thanks for posting! Well, here it is 3 years later and they’re still at it, but they haven’t raised their rates, it’s still $85. Aren’t we lucky. I’m going to write an article plagiarizing some of your article and put this on Linkedin, FB and Twitter to resurrect the conversation and perhaps put them out of business. I hope that’s okay with you. Thank you for confirming my suspicions about these fraudulent scammers! I am just happy I got the web domain on my dad’s behalf, because had he or his office had received this, I’m pretty sure they would’ve paid these clowns. They look somewhat legit beyond the disclaimer you pointed out, so those with little web/search engine knowledge could easily be fooled and frightened into paying for their bogus services. Got one today for $85/year. The funny thing is that ‘this is not a bill’ was actually quite large and bold, not in fine print. Very true! Anyone that sends money in is a fool. In a nasty way: Good for Web Listing!!! Thank you for posting this. I got mine today $85.00 looks like the price is staying the same over the past few years. Guess inflation doesn’t hit the scamming business as fast as it does everybody else. I got the letter few days ago my partner got so angry, I am the person in charge for the payments, I was very confuse, we thought we were loosing our domain name, I call 1&1 they confirm the scamming , the address is 1623 Military RD # 926 Niagara Falls , NY 14304-1745,. I hope the FBI do something about it, Thanks to all . Just got one these letters in the mail. This is certainly an unscrupulous way to advertise. Go find a set of checks that you know that the account is closed. Use one of those checks and send it to Web Listing Inc. When they try to cash your useless check, they will be charged a $35.00 banking fee. Though … As they state very clearly that their piece of paper to you is: “THIS IS NOT A BILL.” anyone that sends in money is a fool. I have to admire the owners of that company. They are honest and up front. GOOD FOR THEM! Welcome to the USA!!!! Greed makes ppl by into that as well. I just got a letter today for $85. I’m thinking, you shouldn’t have to pay to be noticed. Yep, got the letter this morning asking for $85. No phone number, address says 1623 Military Road #926, Niagra Fallls, NY. Unreal. I can see how others would be concerned and pay this. DON’T! I got a letter like this for my mother who has been dead for 13 years. Thank you very much for sharing. I just got a letter by them asking for $85 which surprised me for a service I never asked for. It pisses me off when a so called legit firm does that. How can we stop them? It’s too shameful and such a disgrace. The scary part though is they got my domain name and some how they found my exact postal address, where did they get it from. Can they even legally do that? Do you all guys hood your domain with 1&1 ? Wow I was just to send them my 85 dollars when I just happened to see this site and decided to check n it out. Im glad I did because I would have wasted my money that I don’t have much of in the first place. Thank you for sharing. Thanks for the warning! They almost took $85 from me. I’m glad I decided to do some research like you mention here. Well I done my research, Thanks for the honest information, wish we had more people like that around. Thank you! We almost paid $85 for our new non-profit. Your post saved us!! These jerks are still attempting to scam people. Today is 11/24/2017 and I just received one of their fake bills for $85. They are harvesting the mailing addresses off of the domain registration WHOIS data and pulling this scam. i didnt read they fine print and we actually sent a check! OMG!